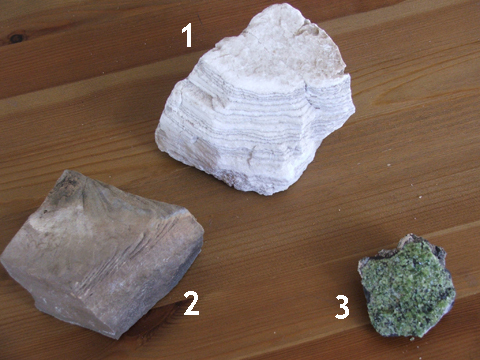 For the 4th edition of The Accretionary Wedge blog carnival, which is hosted over at goodSchist, we are showing off our favorite pet rocks (or “deskcrops” as coined by Thermochronic). The first shot below is an “overview” shot of three of my favorite deskcrops (or, more correctly in this case, bookcasecrops). Stopping along Highway 62/180 in between Guadalupe Mtns National Park and Carlsbad Caverns is a favorite for geology field trips of any kind. At this location, you are not in any national park and can smash and grab as much of this rock as you want. The photo below is a close-up of these beautifully-varved evaporites (alternating calcite and anhydrite, and some halite in there too). 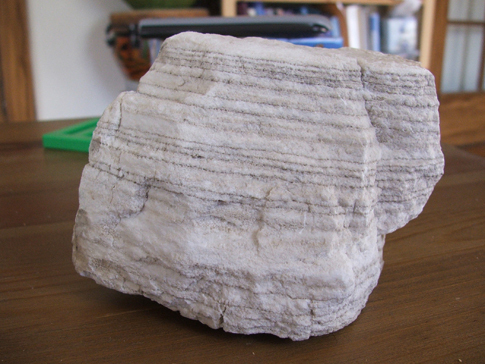 Also from the Permian Delaware Basin of west Texas and New Mexico, this sample was given to me by my master’s advisor. 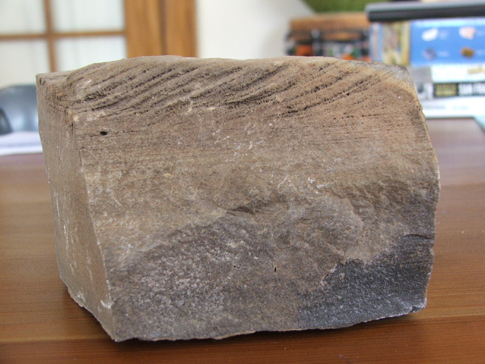 It is from the Cherry Canyon Formation and nicely shows the “a”, “b” and “c” divisions of a Bouma turbidite sequence. The “a” division is a the base and is normally-graded and structureless (just the very bottom of this particular deskcrop). This grades upwards into the plane-laminated “b” division. And, finally, the top of the deskcrop is the ripple-laminated “c” division. What’s particularly nice about this sample is how exquisite the ripple forms are preserved. One of my favorites! I didn’t even realize until now that all of these deskcrops are from the same region. I picked up some beautiful xenoliths from this maar volcano just last September. 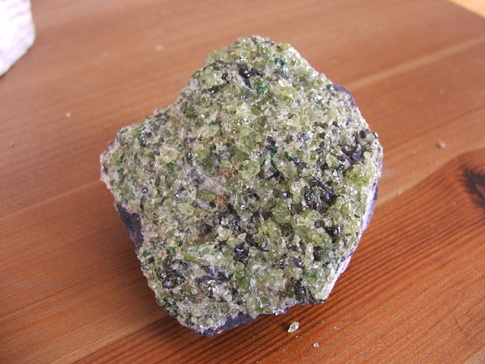 The locale is a little tricky to find (it’s a hole in the desert), but there are still lots of beautiful olivine/pyroxene xenoliths like this one to find if you can find it. Thanks to Chris over at goodSchist for hosting…go check it out. I recognized that Castille Formation immediately and nearly included one in my own Accretionary Wedge #4 entry. I do have a piece of Kilbourne Hole in mine, as well as another piece of the El Capitan Reef (more specifically the Muleshoe Mound) that you might recognize – see if you can find them. Did you notice the base-surge ash deposits around the east side of Kilbourne’s Hole? They can make for some neat photos. Hope you didn’t have any encounters with the rattlesnakes that are rather common there. Someone also (supposedly) saw a Gila Monster at Kilbourne’s Hole, years ago. I seem to remember that actually being in print somewhere. Yes, the base-surge deposits are fantastic…incredible cross-bedding and some lapilli as well. We didn’t see any rattlesnakes that day, but I did my master’s in west Texas and we would see them from time to time.